What if there was a contract that expressly stipulated how you should run your life? A contract that was designed by you, signed by you and monitored by you. A contract that honoured the wishes of the most important person in your life – you. 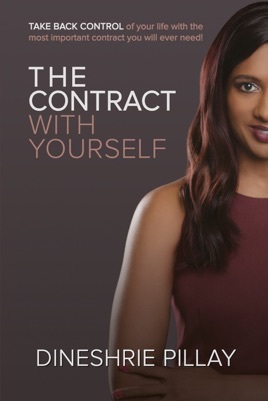 Dineshrie Pillay explores what the ideal contract with yourself could look like, with a view to achieving your personal success. Instructive and inspirational, The Contract With Yourself is filled with useful stories, analogies, and practical action steps that you can easily apply to assess and plan your life. This easy-to-read self-motivation book runs 182 pages and deals with all areas of life, including work, family, finances, health, self-image and personal goals. It is a practical and simple reminder of all the action steps that can be taken to make progress towards achieving individual success and fulfilment. Each chapter includes activities, post-chapter reflection, guiding questions and reminders that can be used as a tool for ongoing personal reflection. The main text is easy to read and follow, supported by examples and anecdotes to illustrate key points. Each chapter can be read in isolation, making it easy for the reader to work their way through the book in their own time. The wealth of information that is contained within this book can easily be carried along on business travels, holidays or longer trips as the reader progresses through the book. The Contract With Yourself is based on author Dineshrie Pillay’s experience as a professional in business, which spans over 20 years. Success is the outcome of consistently adopting simple life principles. This book is a reminder of those life principles.